I didn't know that I needed this book until I stumbled across it this past week. 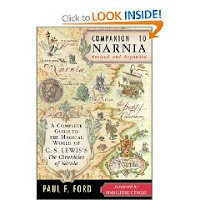 I should have known about Companion to Narnia: A Complete Guide to the Magical World of C.S. Lewis's The Chronicles of Narnia all along I suppose. It's well-publicized and heralded as being nothing short of "An exceptional reference work!" full of "clear prose, accurate scholarship, plentiful cross-references", etc., etc. With all that hype you'd think I might have noticed at some point. However, I do confess it to be a new discovery but one I am thankful to have made. This book contains illustrations, maps, drawings, a comparison of Narnia and Earth time and the "much, much more!" that you hear about so frequently. If you want to follow a theme in Narnia or learn about the significance or history of any one particular character, tree or mouse, this is the book for you. I found a copy of this fourth edition (1994, I do believe) at a used book store just this past week. There is an an updated version (2005) that the cast and crew of the movies apparently used to better understand this mysterious and magical world that Lewis created. I can see how this would have come in handy in trying to understand the sometimes complex and confusing history of this series. This is a book you would not want to peruse unless you had already read Chronicles. It won't make a whole lot of sense to you otherwise. However, anyone who is planning an upcoming re-read of the books, or is in the middle of a re-read, would definitely benefit from having a copy of the Companion on hand. It's mind blowing. You just never know how much you don't know until you pick up a book like this . . .